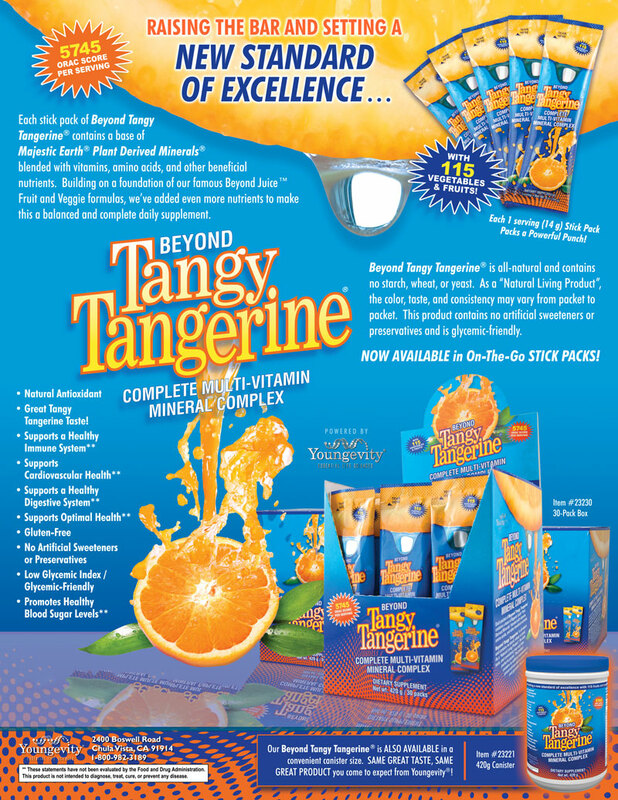 Beyond Tangy Tangerine is a unique multivitamin mineral complex in a powdered form. Beyond Tangy Tangerine contains a base of Majestic Earth Plant Derived Minerals blended with vitamins, amino acids, and other beneficial nutrients to make a balanced and complete daily supplement. For people who are used to taking supplements this Youngevity Product will be right up your alley. It is easy to blend with water or juice and has a smooth great taste. The base of Majestic Earth Plant Derived Minerals is the magic of Beyond Tangy Tangerine and is what sets it apart from all other mineral and vitamin supplements as these minerals are severely lacking in today’s processed foods, depleted soils and standard vitamin supplements. It is a natural antioxidant and provides a great tangy tangerine taste and also packs a whopping 115 fruits and vegetables within it to support optimal health and a healthy immune, cardiovascular, and digestive system. You can be happy because it is also gluten-free with no artificial sweeteners or preservatives. No worries for diabetics either because Beyond Tangy Tangerine is a low glycemic index/glycemic friendly product and thus promotes health blood sugar levels. SUGGESTED USE: Adults, mix one packet in water or juice per 100 pounds of body weight, 1 to 2 times daily. Children – 1/4 packet daily per 20 pounds of body weight. Then enjoy the taste and love the health benefits and the vibrant feel. Because it is in powder form you can take it on the go and never be without your minerals and vitamins.